just my power tools and me. I had this old compartmented box and an idea. As you can see I am not trim work expert! The graphic was added by printing an image in reverse, trim it so there isn't much paper around your image. Coat the printed side with Modge Podge, add it to your surface and let it dry completely. soak the paper again and start rubbing all the paper off. The image will stay on the surface! Give it a coat of wax or Polycrylic and you are good to go! What would you put in all these little cubbies? That looks awesome. What a great idea, and I love the white! I love it, Susan! My first thought was it would be great in a mudroom or near a front door for people to put their shoes in. 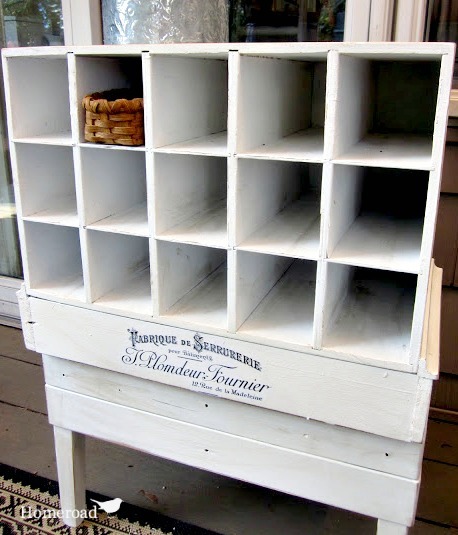 Also great in a craft or sewing room to keep supplies organized. Love the graphic you added. Can I ask ~ did you decoupage it on? I've got a project planned today that I'm painting white and I wanted to just decoupage the graphic on. I'm thinking that the white paper will blend in better with the white paint. 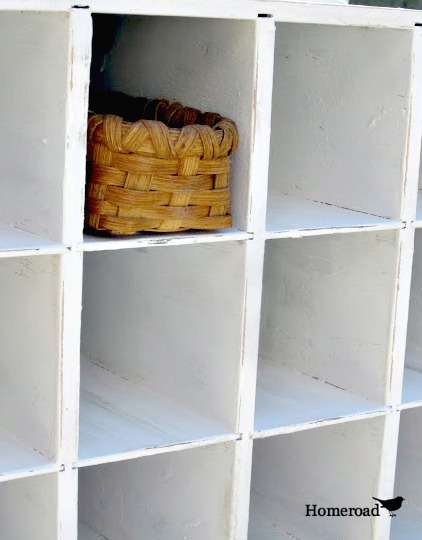 looks like a great organizer for all of the mail that comes in for different family members. very cool! It looks like it came right out of an old general store. Great job - I always love seeing your projects! Awesome as usual! Can you incorporate this into a June wedding? LOVE THIS! YOU DID A TERRIFIC JOB IT LOOKS AMAZING. BINGO! That's what I was thinking! Very cool - the ad makes it! Wow. Very nicely done. Great inspiration! I subscribe by email to your blog and love to get your posts! See ya around. Wow,I love that you added the graphic. It makes it even better. I was thinking of craft supplies as well. Perfect for those smaller tools. That was brilliant! Great idea and it looks stunning! I would fill it with yarn. Love it! I am with you I would fill it with yarn also!!! Yep! That's what I was going to say! And it's eye-level so you could sit and gaze upon it! LOL! You could see what you have to work with also. Mine gets buried in big baskets and I hate to "rummage" through it...it get's tangled. This bin system would be perfect! Thank you....now I just need to find one or figure out how to build one! Beautiful job! I LOVE cubbies...so this is awesome! I, too, am curious as to how you did the graphics? Thanks Rene... I updated the post with instructions on how to add an image to the box! Have fun! Thanks for the info...that's the same technique' I use...it really did turn out great! It looks great! I love the two pieces together and the graphics! I LOVE this piece. The graphic adds some neat character. Susan--wow! it's great! putting the three pieces together is pure genius! I usually take things apart... well mostly. Sometimes I marry them.. well it's about 50/50 I guess. Anyway-I LOVE your new cubbie table! it's perfect! Ooooohhhh!!!! This I love Susan!!! Nice job!!!! il est superbe déjà dans sa forme mais avec ce graphisme c'est vraiment génial ! Such a great idea. I to love cubbies. I am always trying to find places to stash things. Must try. ok so for the print you added, after the paper dries you say to "soak it again". what are you soaking it with water or glue? Wonderful! But I have the same question: Modge Podge again? And just like Nath asked: regular printer paper or something else? Thanks a lot for your help... and inspiration! Modge Podge is my hero! I painted it on the printed side of regular computer paper (don't forget to copy it in reverse). Rub out all the bubbles, when the paper dries completely (24 hrs) wet it with water and start rubbing the paper off. Keep rubbing until all you have left is the image on the wood (it adheres to the Modge Podge) Then wax or Polycrylic over the image.... Try it on scrap wood first, I've done this on clay pots too! I love this method. Stay tuned to Homeroad I use it a lot! Saw your lovely project on the Graphics Fairy. I definitely would put art supplies in the cubbies. Where can one find cubbies? In thrift shops? Thanks for sharing how you did the graphics on the great cubby table. I think that would be a great place to hold a yarn stash. I am visiting from My repurposed life linky. I loved it then and I love it now! Thanks for dusting it off from the archives to link it up. Beautiful piece, I love the image! Does this method work with an ink-jet printer or just laser? A perfect marriage! Love the image you added too. Thanks for sharing at Vintage Inspiration Party. I'm inspired.